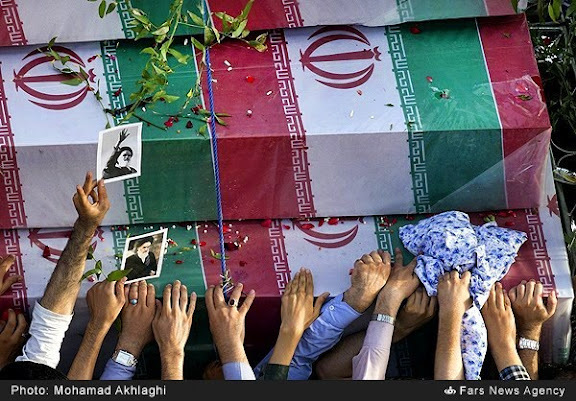 Commentary on Iran media imagery depicting the 16JUN15 ceremony in Tehran honoring the return of 270 victims of the Iran-Iraq War, including 170 combat divers buried alive by Saddam Hussein's Baath-Iraqi troops during Operation Karbala-4. 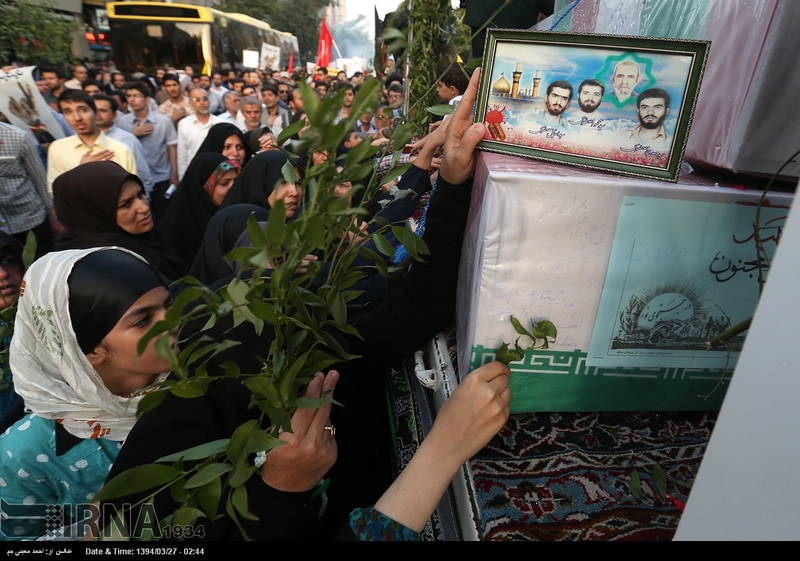 Massive turnout at Baharestan Square in downtown Tehran, paying respect to returned remains of Iranian soldiers and combat divers, the latter executed by live-burial by Baath-Iraqi troops. 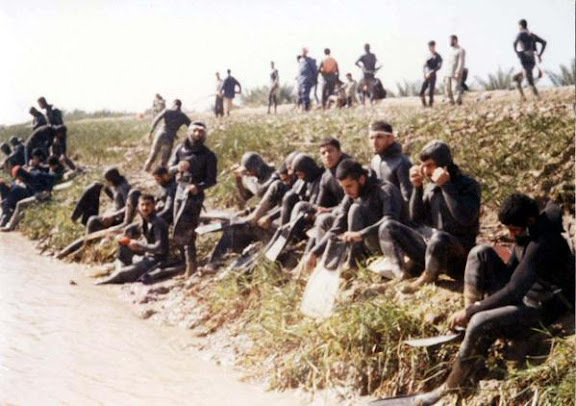 The account of the divers appears to resonate with a cross-spectrum of Iranian society, given the cruelty of Baath regime during the Iran-Iraq War and the current cruelty witnessed in the region at the hands of ISIL. 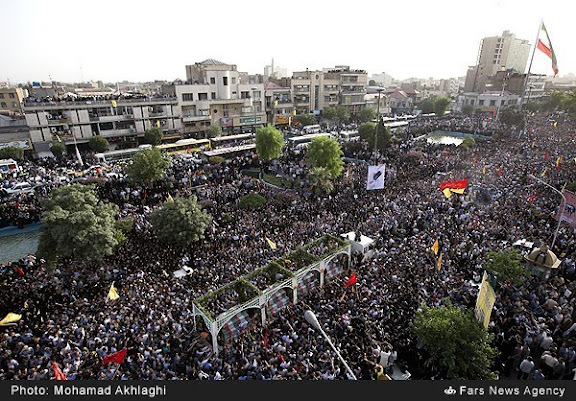 This turnout also serves to further validate what observers inside and outside of Iran have described as a now prevailing, popular support for Iranian military assistance provided to Syria and Iraq. This support is now being expressed openly by Reformists (see HERE). To put this American terms, the "Support our Troops" movement so prevailing since 9/11 may be instructive in understanding such a sociopolitical shift, especially when compared to the American era of the latter Vietnam War and its aftermath. 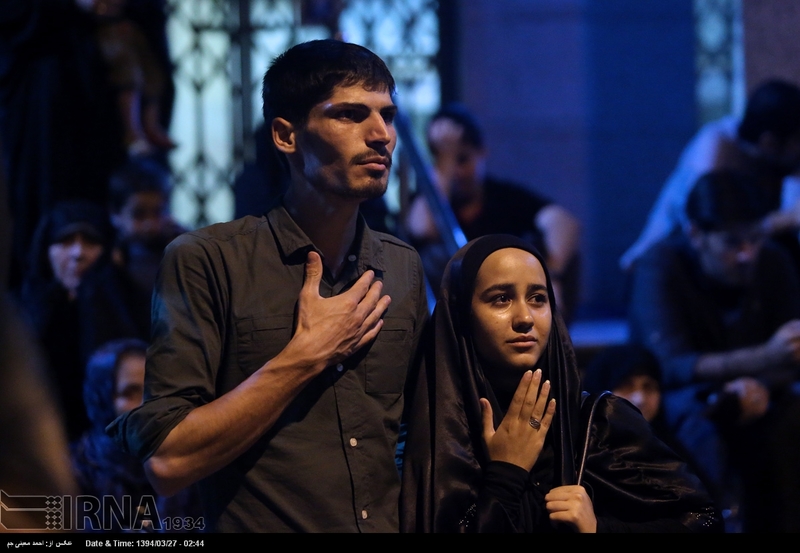 In addition to the Basij organization, of which members are seen beside flag-draped coffins of returning war dead, the liberal House of Cinema also issued statements of support for sacrifices made during what Iran's term "The Imposed War." Conservatively dressed elements of society (likely from southern Tehran) paying respects to returned remains of Iranian fallen from the Iran-Iraq War. Further evidence of emotions on display, for returned remains of fallen soldiers and combat divers from the Iran-Iraq War. 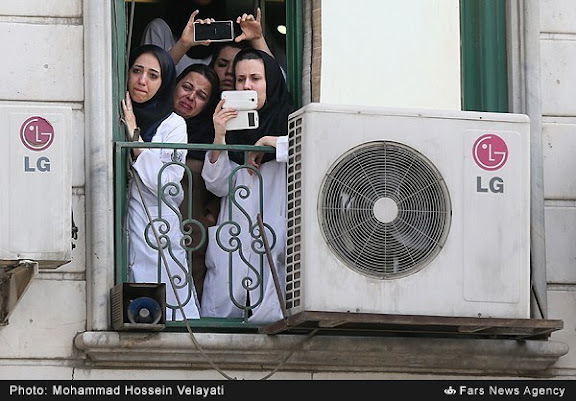 Evidence of emotional Iranian youths of about the same age as the combat divers, fallen during a past period of national emergency. Imagery of Supreme Leader Ayatollah Khomeni among hands touching coffins containing returned remains of fallen soldiers and combat divers from the Iran-Iraq War. 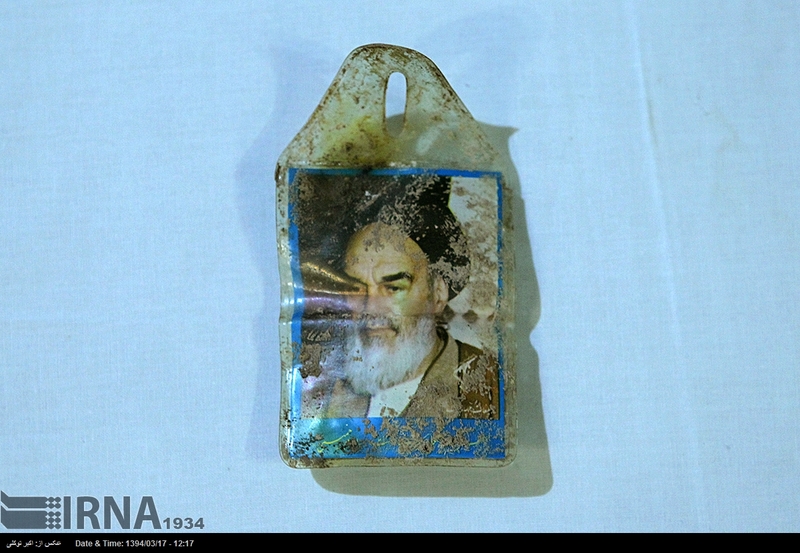 Recovered water-proofed imagery of founder of the Islamic Republic worn into battle by combat diver during Operation Karbala-4. IRGC Brig. 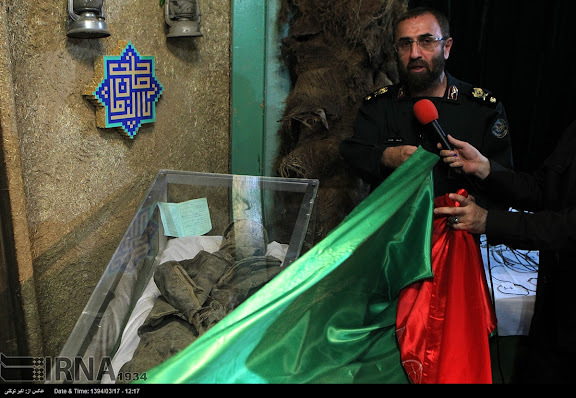 Gen. Seyed Mohammad Baqerzadeh, commander of Committee for the Search for the Missing, beside remains of combat diver executed by live-burial by Baath-Iraqi troops during the Iran-Iraq War. Iran's political and military leadership has taken the occasion to promote the assigning of blame for the failure of Operation Karbala-4 on American support for Saddam Hussein during the Iran-Iraq War. Saddam beat the life out of iran. Beat a country twice iraq's size into a humiliating defeat. 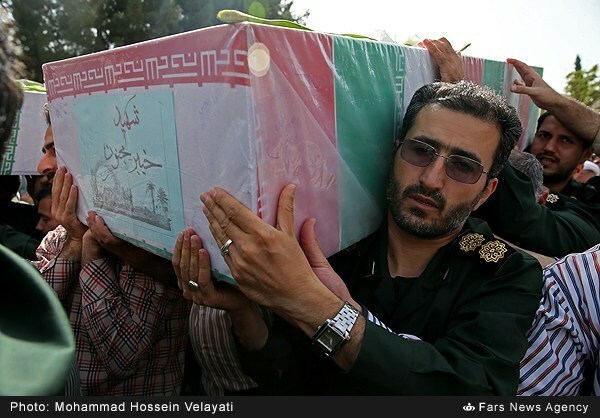 RIP to all the fallen heroes of Iran and its brave armed forces. Yes Saddam was a strategic genius, a true Napoleon of our time, that's why Iraq today is a strong, stable and prosperous country. There were no winners only losers, both countries have changed forever due to the Crazy Saddam's irrational actions. A terrible war to both sides...It's not a sport match, it's real, painful, and hard to forget for many generations of Iraqis and Iranians. that is bull-talk and you know that. Iraq is now effectively an Iranian colony and Saddam was also hanged plus his sons and other cronies. I'm sorry to see that individuals like you still don't get it. Any tragedy is a human tragedy no matter where it happens and who suffers. History is full of the story of shameful human behavior. If we want to develop as a human being and act as a human being, we need to change this path. This is an act of barbarism, as it is with all wars. There is nothing to be proud of killing people and destroying humanity. Humanity is something which we need to explore, understand, accept, and learn to become a human. War increases animosity and prevents the development of societies based on the principles of the Universal Declaration of Human Rights, which the implementation of it is lacking in this planet. This is the tragedy. Please wake up and let's search for our own humanity. Let's start from ourselves no matter what others do. Yeah, that's why he ended up on the defensive for most of the war (6 years) and after only 2 years of starting his campaign, almost losing Baghdad in the process had it not been for chemical weapons, limitless oil money from his Persian Gulf neighbors, international support (arms and money) and direct U.S involvement against Iran during the tanker war. Not to mention that Iran had just come out of a revolution, was under an international arms embargo, and was caught by surprise. Mate, you need to work on your definition of "humiliating defeat"! Which humiliating defeat are you talking about? Attacking a new revolution with dysfunctional Army, not being able to take an inch despite billions of aid and all powers intelligence and support. only a lunatic would call Saddam's war his victory. In a parallel universe perhaps, in the kingdom of bitterness! twice? try three and half times with more than twice the population. still iraqis on iraqs soil fought off the brainwashed baseeji human waves. akhoonds regime got stronger from this war used like tool for radicalizing the population and imposing religious laws on the society... so there was zero interest in stopping the war. iranians wake up...make your own research on the faults of your dear akhoond regime...not just buy whatever it feeds you. i have relatives that were at the front. they agree on the uselessness and vanity of extending the war Another six years after liberation of khorramshahr and akhoond ignorance of the opportunity to restore borders but nobody can speak of these things for fear of the dictator. 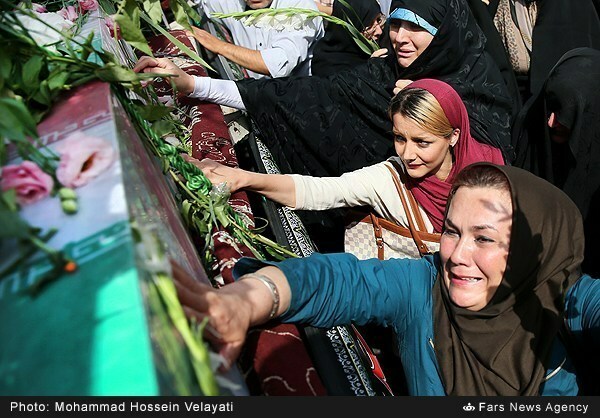 Respect the sacrifices of Iran's valiant sons and daughters and keep your Iran-hate and bitterness in check! not very healthy indeed. Last time i checked it didn't take Iran 24 hours after the initial Iraqi assault to be able to mount a massive counter-offensive named Kaman-99 involving more than 170 aircraft and crippling every single major Iraqi airbase and logistical infrastructure for several weeks and reducing the IrAF's efficiency by more than half, breaking the momentum of the Iraqi surprise war effort in its early stages and allowing the Iranian armed forces to reorganize, refortify and be in a more viable posture to resist armed columns moving into border areas. A mere months later, a brilliant combined air and sea operation allowed the Iranians to literally wipe out 90% of the Iraqi navy while taking control of several key oil installation right under the noses of the Iraqis that found their counter-attack completely annihilated by IRIAF F-14s following the F-4 strike package. And of of this happened while Iran was already coping with spare shortages and had to rework sabotaged weapon systems on their most prized asset that was the AIM-54 phoenix missile, all the while Iraq in contrast was able to simply ask and get its tanks, aircraft and other assets replaced and funded instantly, with full support from both he west and the USSR, not to mention Petromonarchs' oil money through limitless war loans. Iraq in fact managed the extraordinary feat not only to lose every inch of conquered territory by 81 but also lost critical, strategic part of its oil corridors and installations during the Iranian counter offensive while enjoying all the backing in the world, the element of surprise and a chaotic, unprepared and partly purged post-revolution Iranian military. The fact that Khomeini obsessive stubbornness with taking the war to Baghdad and ignoring the KSA's lucrative offer of a 200 billion dollar compensation package ended with Iran's military being totally exhausted, feeling the heat of a persisting arms embargo while facing invigorated Iraqi armed forces that had replenished their entire air fleet and mechanized assets and even surpassed the remaining Iranian operational inventory in numbers past 86-7 is another story and cannot possibly be called a humiliating defeat, but rather a logical and expected outcome for any military machine with a collapsing logistical base. Go grab a history book and/or a brain mate, it's getting urgent, you're the only entity going though humiliation here through your laughable one-liner trolls. 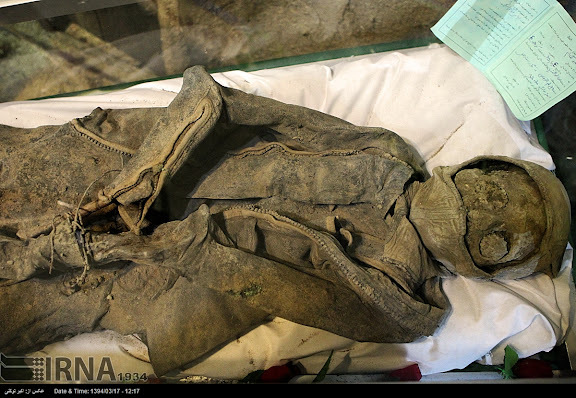 To say that saddam gave Iran humiliating defeat is to accept that one as been living in Mars all the while. In fact one of the anonymous sums it all, Saddam was hanged by Iran allies in power in iraq after 20 years. 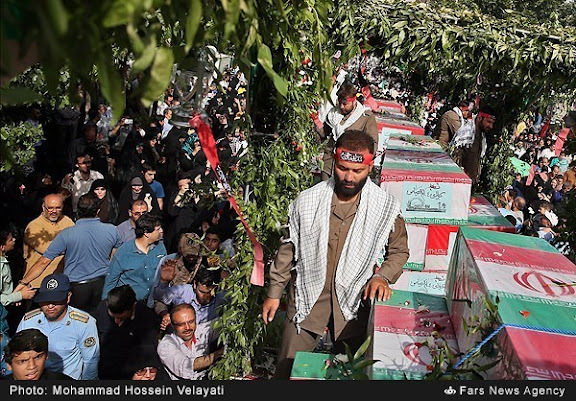 By 1982 Iran had won this war.But Khomeini choose to extend the war for another six more pointless years.This war was a "god send" he claimed.However Iranians do not want to be involved with anymore wars that will result in scenes such as these. may the ALMIGHTY bring peace and tolerance in the hearts of Muslims !,such that we wont see a brother hurting a brother !. and thirty years we have practically Iraq as another province of Iran. Syria is all but turned into an Iranian satellites, Lebanon is the Iranian corridor to Mediterranean with Hezbollah running the show for Iran plus Yemen next to KSA is practically another Iranian Satellite. Islamic Republic has practically achieved more and less what Safavid could not in 16th century. The reality is now different compared to thirty years ago. US has realized that it is far more cost effective to live with Iran as opposed to opposing it. That is the reason that Persian Gulf Sheikhs are feeling the heat!. 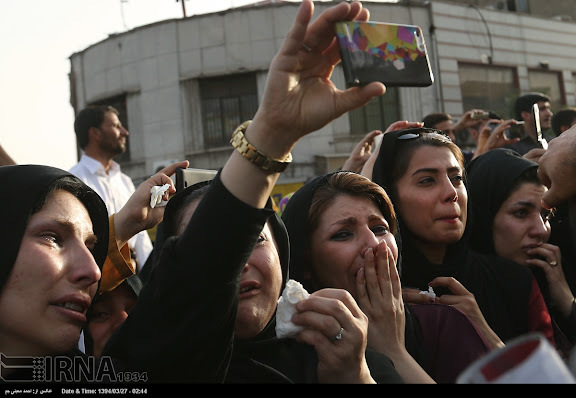 The Iran-Iraq war was an extremly sad episode in human history. It's too bad, the peoples' of the region should have taken lessons from such a tragic and pointless conflict. I fully agree with fellow commentators pointing out that both Saddam and Khomeini should have engaged in peace talks in an effort to end the war in 1982. An end to the war would have saved many lives on both sides and spared both countries from further destruction. 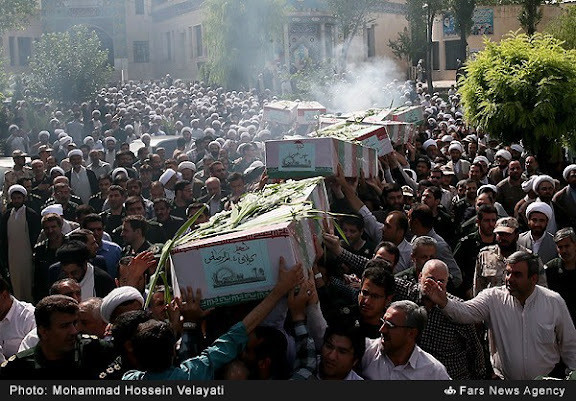 God help Iran from lies drought and war. So far all those three have afflicted us.